Assorted Cut Fruit on Platter - This miniature Assorted Cut Fruit on Platter will look lovely on your dollhouse table. The colorful fruit is so realistic looking. This ceramic platter of fruit is 1/12th scale and measures 1-1/8" in diameter. 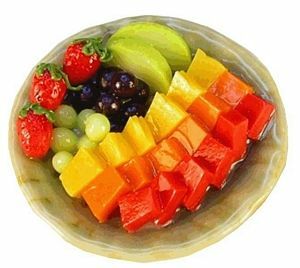 This Assorted Cut Fruit on Platter is supplied by Bright deLights Miniatures, which generally ships within 12 business day(s) of you placing your order .